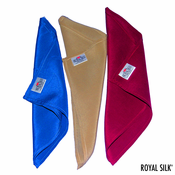 Enjoy the incredible softness of silk combined with the genuine warmth of cashmere wool. Smart, sophisticated, and stylish, this nifty neck scarf is perfect for children. You would be surprised at how effective it is during a wave of chill. What's more - it is easily tuckable. One side is a premium blend of 70% cashmere and 30% silk, also known and prized as silk pashmina - so soft, light, and pure that it will never pill. The other side is beautifully lined with pure India silk in a matching color. Sized 6" by 40". Washable - comes with instructions. Select from six classic colors. This is a superb gift item and an ideal stocking stuffer. Hand-made fringes on both ends of the scarf.